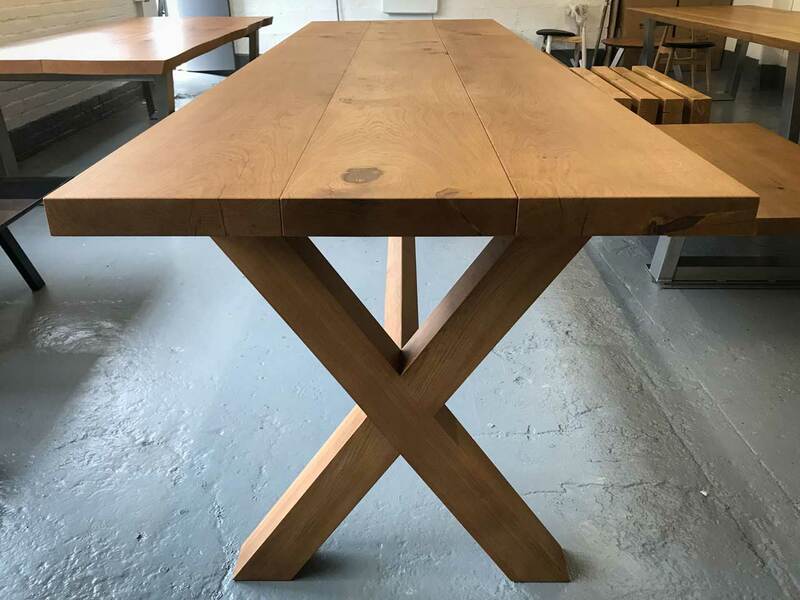 If you’re looking for a bespoke dining table, we can create a custom table design design for you that’s specifically tailored to the exact style and size you’re after. 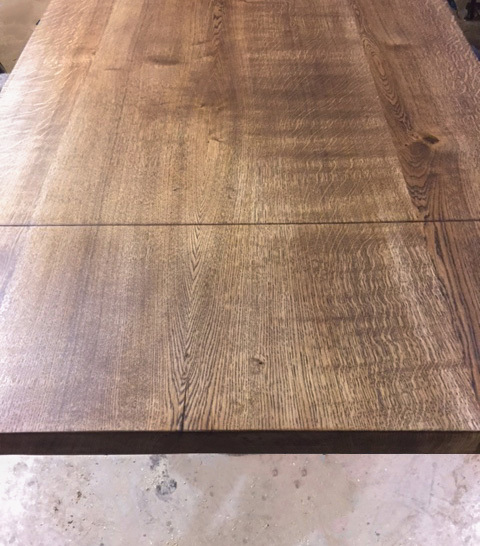 We have access to a huge range of timbers that are perfect for a bespoke oak dining table. 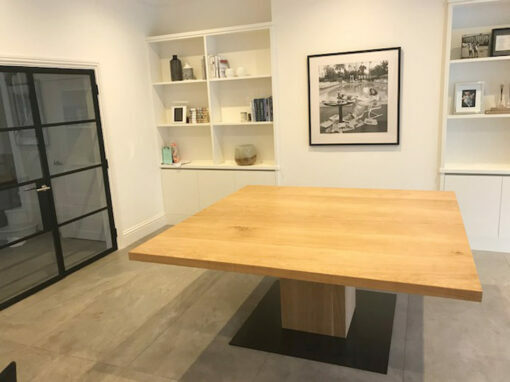 If you’re looking for a table made of something other than timber, we also work with man-made stone surfaces, acrylic, steel, and glass. As each piece is custom built, you can choose any size, style, and finish. Let us know what your requirement are and we’ll send over some suggestions that are tailored to you. Watch our video to see what makes Abacus Tables unique. This client liked our Komodo table design, but was short on space so wanted us to create a version of the table that maximised seating room. 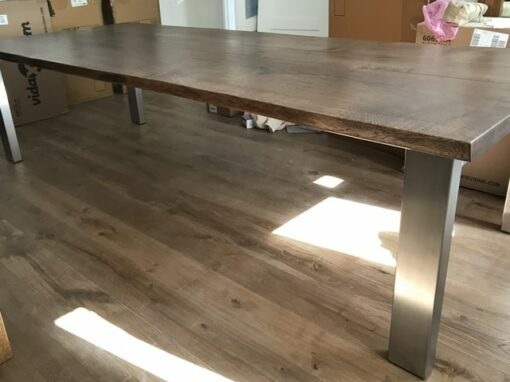 We removed the stainless steel cross-piece at the bottom of the base, and moved the legs out towards the ends of the table. We also reversed the angles of the legs to allow more pace for the people sat at either end of the table. 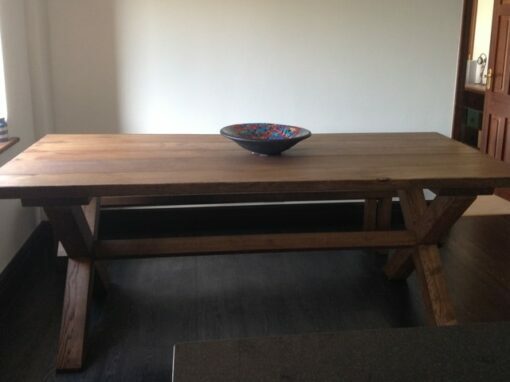 The result was a bespoke oak table based on our popular Komodo design, tailor-made to suit the clients needs perfectly. If you like the idea of being able to plonk scolding hot pans straight onto your brand new table, this first design might appeal. It’s one of our Komodo tables but with a twist – The centerpiece of the table top is made from Dekton (a super resilient synthetic stone surface). This surface is made from natural minerals which are exposed to a super high temperature and pressure, in a similar process to that used in the creation of synthetic diamonds. It comes in a massive range of stunning colours and patterns (like marble, slate, and granite), and is incredibly resilient to scratches, stains, and heat. You can see some of the available colours here. 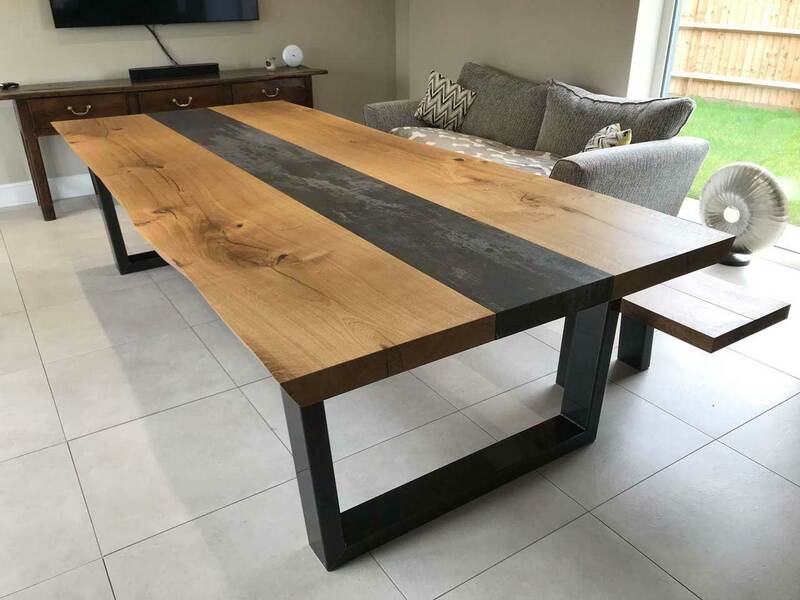 3000mm x 1200mm x 750mm / 65mm thick, Live-edge / Natural oak finish / Lacquered mild steel legs / Trilium Dekton central piece / Matching Komodo bench. For this table we used a traditional design, but in a modern style. The challenge with this one came in the form of a four story apartment building with a narrow staircase. I’m happy to report that the table now resides on the fourth floor overlooking the river Thames (and is likely to for a long time according to our exhausted delivery team). They like a challenge! 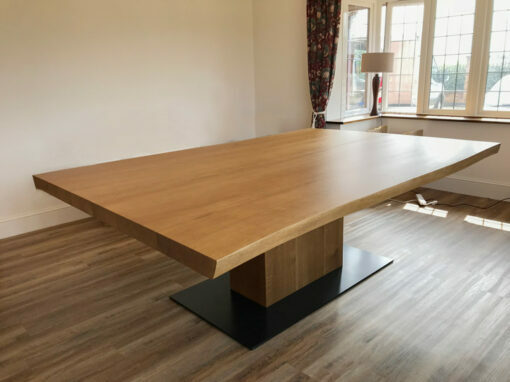 We can make extending versions of all our standard dining table models, as well as bespoke extending dining tables. 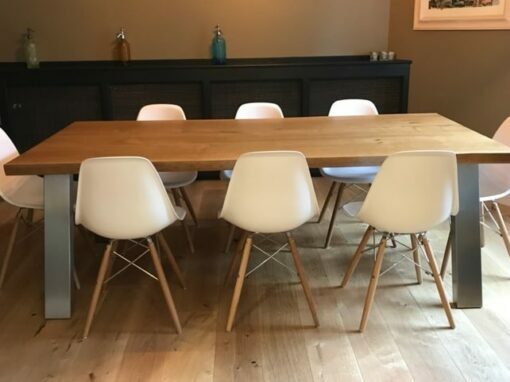 Normally with extending tables, they spend most of their time in the smaller size and are only used at the larger size a few times a year. 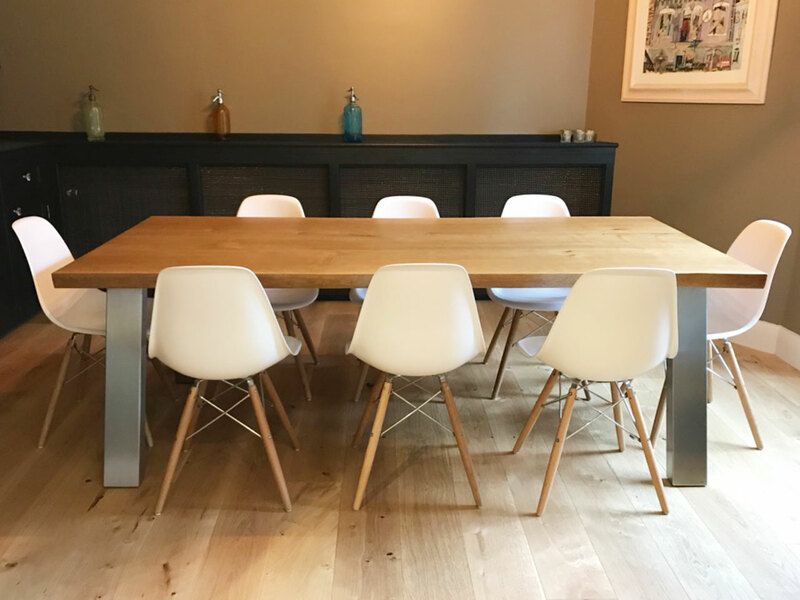 Our philosophy is that the table should be designed to look its very best in the smaller state, with the extension leaf stored separately and made to be as quick and simple as possible for 1 person to install and remove. 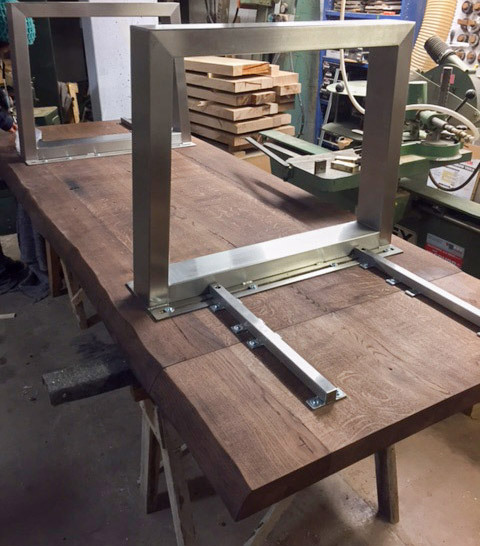 So at each end of the table we have a single extension leaf, 2 custom-made stainless steel support bars with 4 wing bolts, each that can be hand-tightened into the underside of the table top. 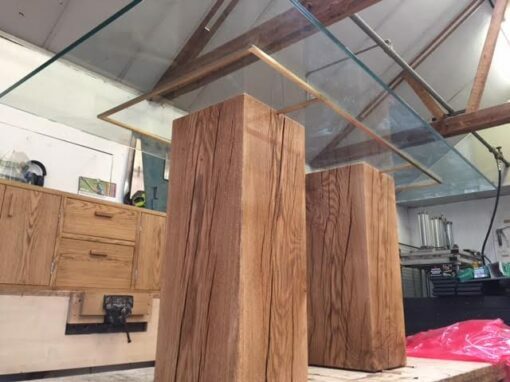 We can also have a flight case made for the extension and supports if you wanted them stored fully protected and easy to carry, or we would just provide you with a packing blanket to keep the oak protected in storage. 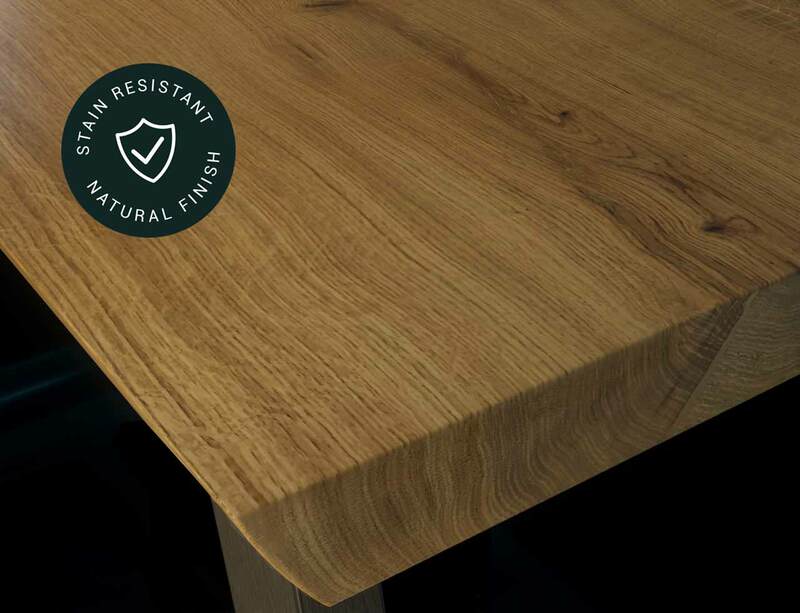 Our Induro® finish has been specifically designed to be ultra stain resistant, whilst keeping the wood surface looking and feeling totally natural. This sounds straightforward, but to arrive at a finish that performs so outstanding well has taken many years of trials and tests. 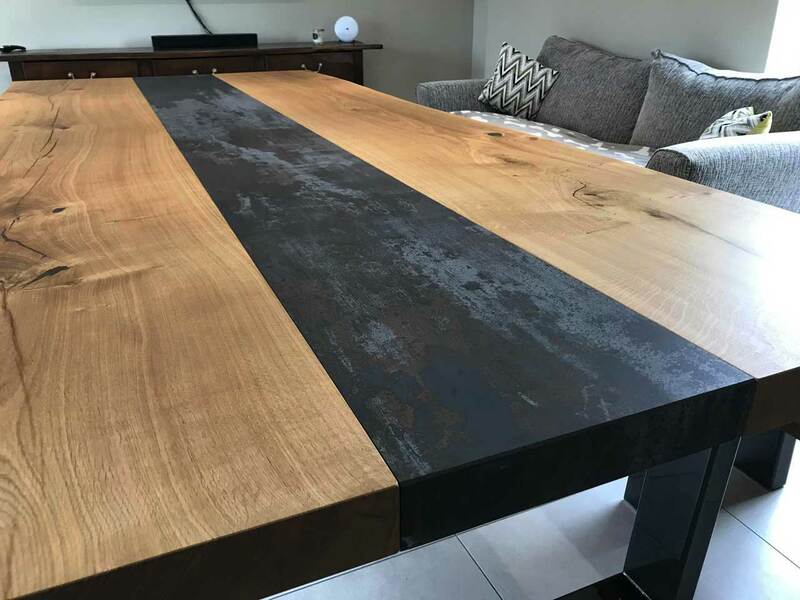 We have tested it’s stain resistance properties against oils, wines, sauces, heat… pretty much anything a table might come into contact with and every substance has wiped away with a lightly damp cloth. That’s not to say it won’t mark, but there is no question that it performs better than any oak finish we have ever seen (including plastic-looking lacquer finishes). 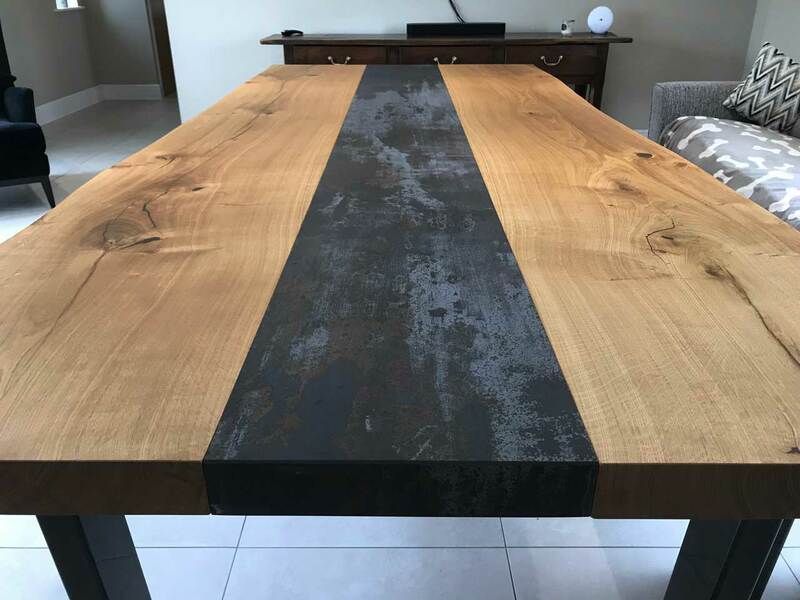 Plus, because it is an oiled finish it is very easy to refresh with a hand-applied coat of oil each year and, if it ever does mark, it can be patch-repaired without needing to strip the entire table. Arguably even more important than the practical performance, the quality of the finish is exceptional too. 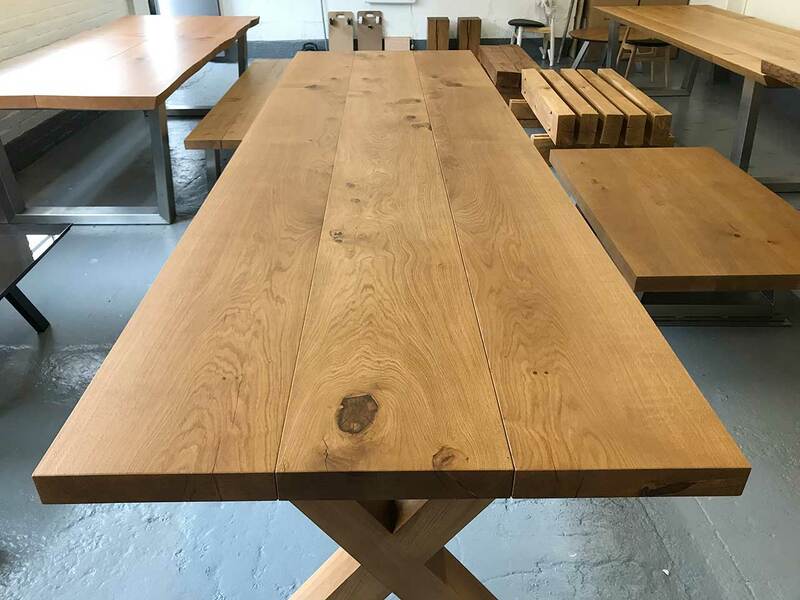 If the performance and quality of the oak finish on your new table is important to you, we’d be happy to send you a set of oak samples for you to see and touch and test the finish for yourself. 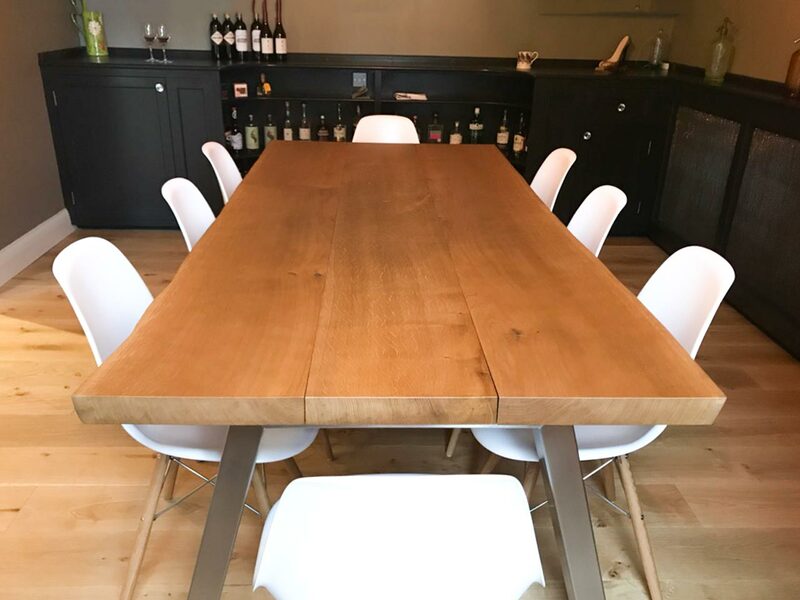 If you want a table with the beautiful natural character and presence that can only come from huge pieces of oak, you should be fully informed about the quirks that come with this type of furniture. Movement, cracking, bending, warping… these are all a possibility with any large piece of natural timber. Some timbers carry much more of a risk of movement than oak, which has a mid-level movement coefficient. After buying boules of oak for many years I can confidently tell you that “kiln dried” does not guarantee that this process has been given the time and care that is required to product indoor furniture that will last. Nevertheless, there is no artificial seasoning process that can replicate the exact heat and moisture levels in your home throughout the year, especially the extreme heat and dry air of a centrally heater home in winter. These are all possibilities regardless of how well seasoned the timber is. 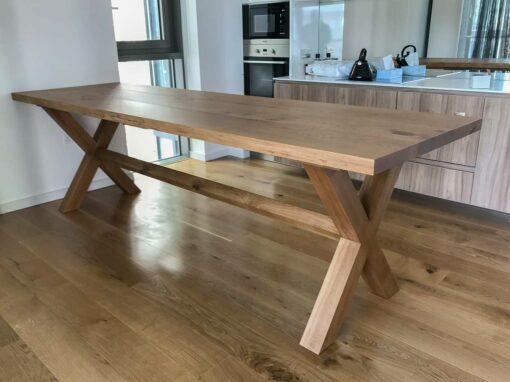 We do everything possible to minimise the risk and the degree of oak movement, including Abacus’ own specially engineered joint system that holds the table rigidly together whilst allowing the oak pieces to move independently from each other and the table legs. 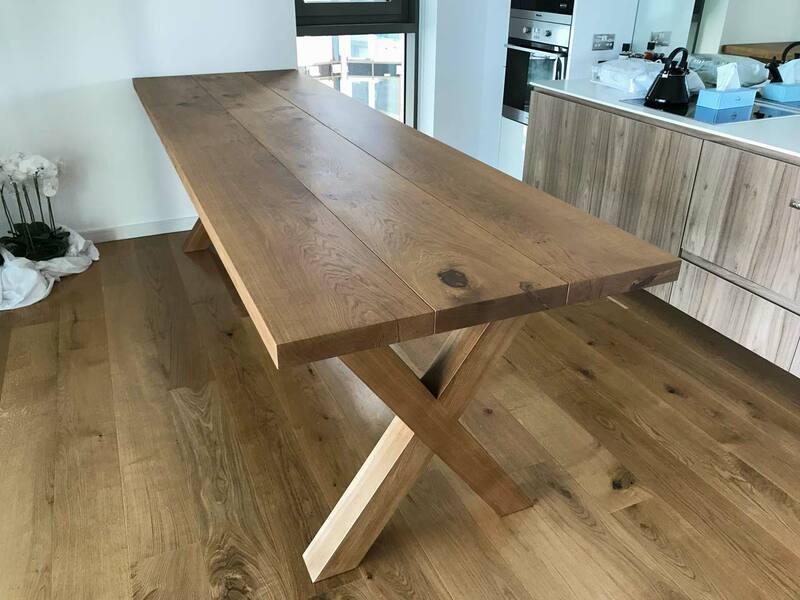 BUT, if you are investing in a real oak table to not just look stunning, but retain its stunning beauty for many many years, it is absolutely essential that your table comes with an aftercare service to address any movement issues that arise within the first 12 months of settling. Providing this vital aftercare service is something very few other table makers are willing or able to do, so our promise to prove this service gives you a unique peace of mind that you can only get when buying a table from Abacus. Until recently we have used independent delivery and service companies to help us provide the aftercare that these tables need. 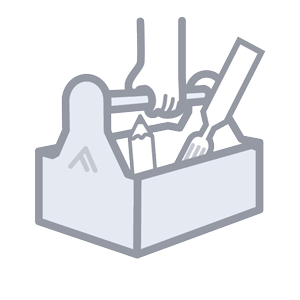 But now we are delighted to introduce our own in-house Abacus installation and service team, operating nationwide with the equipment to address the settling issues your table might experience, without needing to take your table away or you losing a single day of use more than necessary.